What is the Court Moor Character? 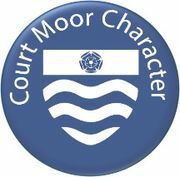 Court Moor is pleased to announce the launch of a new initiative Court Moor Character. It is about the sort of person we want Court Moor Students to be. It is not what an individual student has done, what they have achieved or how talented they are – it is about who they are. At Court Moor we want to encourage, recognise and celebrate students that demonstrate the Court Moor Character. Students will be recognised when they have exhibited one of these characteristics and presented with a special card and wallet to keep them in. Students when they collect all 5 will then be awarded a special badge to wear on their uniform. Please see below a short video about Court Moor Character.